Cavalcade is an all-volunteer non-profit performing arts center created by Fruita, Colorado residents who are dedicated to giving the community a unique place for all ages to experience and participate in high quality live music, philosophical discussion, poetry, and above all a place to be inspired, learn, and have fun. As a career Jeannine has spent many years teaching preschoolers their ABC's and is currently employed at Mesa Valley Community School as the Community Resource Coordinator. Her passion, however, is her family. Jeannine is thrilled that Cavalcade offers fun family events as well as many opportunities for adults to continue to learn and grow. For all general questions about Cavalcade as well as questions about the business side of things Jeannine is your go to gal. Thad moved to Fruita in 2005. Thad stumbled upon Cavalcade in October of 2011 and we are so lucky he did. 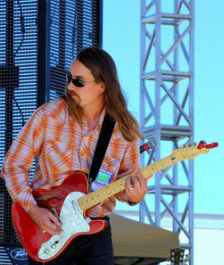 Thad graces the Cavalcade stage often playing guitar, drums, keyboard, and singing. Thad is our detail man and is essential to the running of Cavalcade. Sam has been a tinkerer for as long as he can remember. If it's mechanical, he can fix it. He's also a guitar player and all-around great dad. Part of the magic of our shows is our one-of-a-kind, awesome live sound! Cavalcade was founded by five families: The Benhams, The Cools, The Kreie's, The Purser's, and The Clark-Swihart's. (Not pictured Brendan and Autumn Clark-Swihart, Johnny Cools, and Rachelle Kreie. Be sure to click here for details about our venue!